Cook tortellini to desired doneness as directed on package. Drain. Rinse with cold water to cool; drain well. Cook spinach as directed on package. Drain well; squeeze to remove liquid. 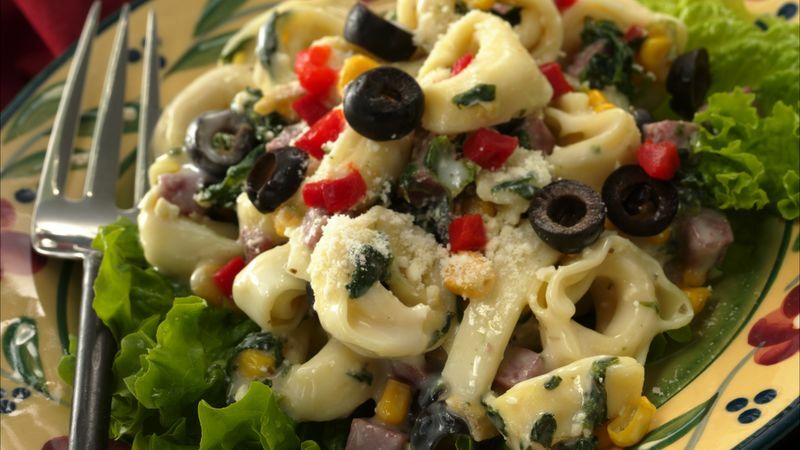 In very large bowl, combine tortellini, spinach, salami, provolone cheese, corn, artichoke hearts and 1 cup of the olives. In small bowl, combine salad dressing, mustard and 1/4 cup of the Parmesan cheese; blend well. Pour dressing over salad; toss gently. Top with remaining olives and Parmesan cheese. Cover; refrigerate 1 to 2 hours to blend flavors. Just before serving, garnish with pimientos.